Ray McKinnon has deemed the racial abuse given to Dennon Lewis by a section of his own supporters on Saturday as "unacceptable", adding that the striker will receive all the support he needs. Lewis reported the abuse after Falkirk were defeated 4-2 by Stenhousemuir on Saturday, with the abuse coming from the main stand at Ochilview Park. He posted on Twitter at lunch time today, with his reaction to the abuse, saying: "I have never gone through a period like this in my life. "From a footballing stand point things are not going as planned for anyone involved at the club however a personal stand point never in a million years would I have expected to be subject to racial abuse from Falkirk fans. Lewis goes on to call the abuse 'disgusting' before adding: "The future is unclear, at this moment in time I am still a Falkirk player and will try to do my best for the team. "I appreciated the messages and know this doesn't embody the Falkirk fans in its entirety." "It's never nice to see anyone got through that sort of thing," McKinnon told the media today. "It's unacceptable and we don't want to see it happening to any player. "Dennon has got all the support he needs, the club have been fantastic. He was in seeing us yesterday, we are doing everything we can to help him and rightly so - he deserves all the support from the club and staff members." 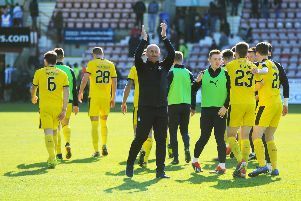 McKinnon added that he hopes to see the culprits banned from attending Falkirk matches, before saying how pleased he was with the Bairns support on Saturday in general. "We don't need that sort of thing at football - there's no need for it and it's unacceptable. It's really disappointing for Dennon and he's really upset with it, devastated. We are giving him our full backing. "When things are personal, that's over the top. It's OK voicing your frustrations at performances and where the club is at the moment - we get that and we all know where we are as a club - but when things get personal it's not helpful. "The statement said that we all stick together on this and I think that's key. All we ask is the fans try not to let their feelings become personal because we are working hard - but the fans have been brilliant, the majority of the fans have been magnificent and the turnout we had on Saturday was tremendous." The Bairns boss hopes to have Lewis available for the trip to Inverness this weekend, but insists he will be given time. "It's something we will have to monitor ahead of the game. We would like him to be available but he is going through some experience at the moment. "He is a young kid, away from home, up from England, so it's nice from him and he's struggling. "We'll give him all the time he needs, if he's not ready for Saturday then we will just have to get on with it."